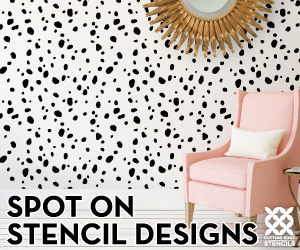 Designed To The Nines | Cutting Edge Wallpaper Stencil Giveaway! You are here: Home / Arizona Midday / Cutting Edge Wallpaper Stencil Giveaway! Comment #35 Melinda T. Congratulations! Please email me at nataleecallahan(at)gmail.com to claim you prize. Thanks for all of you who entered! In conjunction with my appearance on Arizona Midday showing you all how easy it is to do an all over wallpaper stencil, Cutting Edge Stencils has graciously agreed to give one of you a $50 gift certificate to there store! I will be adding today’s segment on how to apply the stencil as soon as it goes live! That’s it! Super easy right? Would you like a few extra entries? Go to Cutting Edge Stencils and pick which stencil you love the most and leave a comment telling which one you chose. Like Designed to the Nines on Facebook. Follow Designed to the Nines on Twitter. Follow Designed to the Nines on Pinterest. Blog, Facebook, and/or tweet about this giveaway. Please be sure to leave a SEPARATE comment for each item! The giveaway will take place on Friday January 20, 2012 at 5:00pm. Thanks! I LOVE this idea…I choose the Diamond Damask Stencil If I’m chosen! I saw you on TV Tuesday, 1/17 and can’t figure out how to leave comments at the Cutting edge website. I love the Paisley allover pattern. I stencilled extensively years ago and am thrilled to see such modern designs rather than the colonial looking ones from yesteryear. I would do the Ikat Samarkand Allover Stencil on the wall behind my bed. I can’t decide what stencil I like most! The Birds on a branch would be fun for my daughters room. I love the Zinnia Grande Flower stencil, the Zamira allover stencil and the Rabat too! Good grief! I love their stuff! I like the Casablanca allover stencil! Or maybe the Turkish Tulip allover stencil. I could probably go on, but I’ll just stop. Oooh, how cool! I would love the forged or chainlink if chosen. These would look amazing in my bedroom and livingroom! I LOVE LOVE LOVE the Zamira all over stencil. 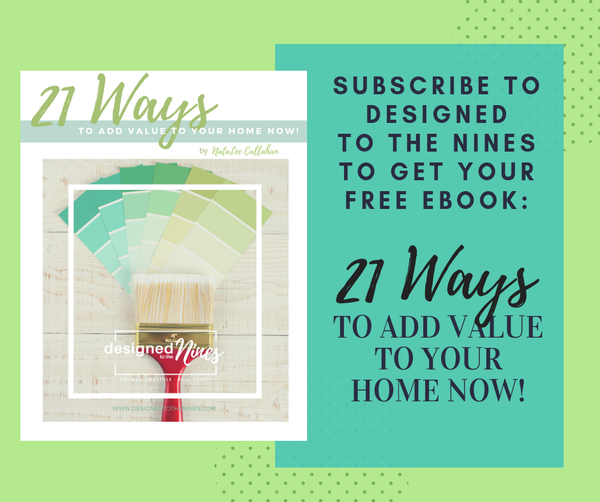 I now follow Designed to the Nines on Pinterest. Thanks for the GREAT giveaway. I’d like to have pretty much any of their damask stencils. I like their Tali damask and their Harmony damask especially. Plan on using the Simple Rhyme stencil to try to match the look and feel of the pattern that is on my daughter’s Dreamstate Disney comforter. This is something I know a lot of other moms on the net are looking for, so hopefully they will find my keywords and this can help them. I’m torn between the Anna Damask and the Allover Poppy stencils. Serious eye candy on that site. I could dream for hours. Thanks!! If I win I might need your help picking what is best for my master bedroom…but I am thinking the Julia Allover Stencil. I hope I win!!! I like cutting edge on fb. I’d love to have the butterfly medallion. I need to redecorate the girls room this year and it’d be perfect! I posted on my fb page. Liked cutting edge stencils on facebook. I like the casablanca design. My favorite stencils are the Paisley Allover and the Entwined Allover. Either would look great in our foyer! I also liked Designed To The Nines on Pinterest.